Whenever the cold weather kicks into high gear, my first thought is to put a big pot of something on the stove and let it cook all day. I’m guessing you’d get the same response from many of my family members as well. It’s just how we were raised! If my Mom didnt have a pot of beef stew, then she’d have a pot of meatballs or chicken stew. There’s just nothing more warming and comforting if you’ve been out in the cold. During our recent cold snap of subzero temperatures, I immediately started my search for whatever I’d decide to cook all day. While I was browsing the interwebs, I happened to be watching The Pioneer Woman. 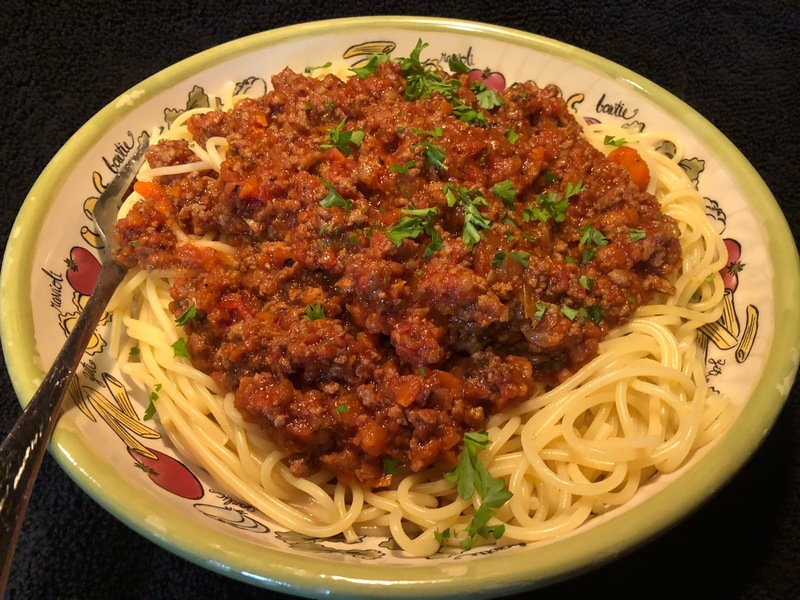 She was making this Bolognese sauce, and I thought “well, THERE’s the recipe I’m looking for!” It was an easy throw together recipe, and I already had most of the ingredients on hand. Easy! So it cooked and cooked and cooked all day, OMG it’s amazing. And the longer it cooks, the better it is. I had some for dinner, saved some for leftovers, and froze the rest. Perfect, huh? So the next time you want a cook-all-day kinda recipe, you should give this one a try. It’s my new fave! And it might become yours too! Heat 2 tablespoons of the oil in a large skillet over medium heat. Add the celery, carrots and onions, season with salt and pepper and cook until softened, about 10 minutes. Stir in the garlic and cook for 30 seconds. Add the tomato paste and cook for a minute. Pour in the red wine and cook until it is mostly evaporated, about 3 minutes. Pour this mixture into a slow cooker. Pour the remaining 2 tablespoons oil into the skillet, add the beef and season with salt and pepper. Cook, breaking up any lumps, until it is nicely browned, about 15 minutes. Drain off any excess fat. Stir in the milk and cook until it is mostly absorbed by the meat, about 5 minutes. Add this to the slow cooker along with the tomatoes, oregano, basil, thyme, red pepper flakes, nutmeg and Parmesan rind if using. Add some salt. Give it a good stir, cover and cook on low for 6 hours. Skim off any fat on top and check the consistency. If it is too thick, add a bit of water. If it is too thin, cook for another 30 minutes with the cover off. Remove the rind and serve over spaghetti with lots of grated Parmesan and topped with fresh basil and parsley. Extra sauce can be frozen for later use. I added quite a lot more red wine, and I also used fresh herbs instead of dried. I think the fresh thyme was a game changer! Just sayin!